One of the myriad schemes cooked up for Battersea Power Station in the 1980s was a theme park. It never materialised, but the image above offers a glimpse of how great it might have been. 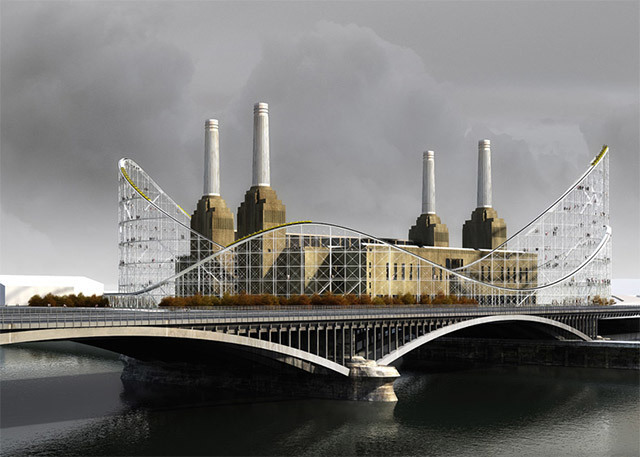 The pic is from a competition-winning entry by French design studio Atelier Zündel Cristea, who responded to a brief that called for a reinvention of Battersea as a exhibition space dedicated to architecture by lassoing an enormous roller coaster around the perimeter. In reality the site is part of a multi-billion pound redevelopment. Sure, it'll provide lots of housing (albeit mainly for rich folk), jobs and a Northern line extension. But we'd give it all up for just one ride on the coaster. More images over at Dezeen.